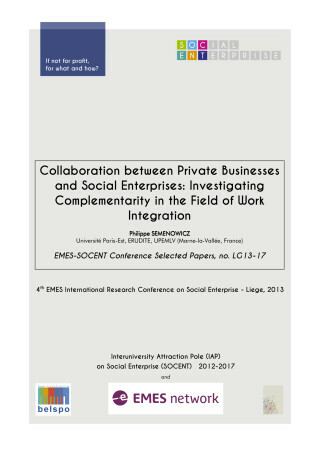 The aim of this paper is to investigate partnerships between private businesses and social enterprises in France. In our case the social enterprise is a ‘structure d’insertion par l’activité économique’ (SIAE), which is equivalent to a work integration social enterprise (WISE) in English. Despite the fact that both sets of economic actors have been in existence since the beginnings of work integration through economic activity, at first the attitude was one of mutual mistrust. Often the ambition of the original exponents of this type of integration was to create an alternative economy in the face of a prevailing economic model that had shown itself to be dysfunctional. When SIAEs appeared, the initial reaction of private businesses was to rail about having to compete with publicly funded organisations. It is interesting to note that since the end of the last decade, private businesses and SIAEs have reconciled their differences, each for their own reasons. The question therefore has to be asked: how should the collaborative ventures between private businesses and SIAEs be understood in this spirit of reconciliation? A distinctive characteristic of SIAEs is their concurrent status as either a non profit organisation (NPO) or a profit-making organisation. In consequence, traditional third sector/social economy models seem unsuitable in explaining this type of establishment. As an alternative to these models, we choose to conceptualise an SIAE as a ‘social enterprise’, in the sense that a social enterprise is not identified by its company statutes, but by its primary objective i.e. the integration into the labour market of people with specific problems at a professional and/or social level. This is in contrast to a ‘commercial enterprise’, the term we use to describe an organisation whose primary objective is to maximise profit (Stokols & Trivedi, 2011). Once we have clarified the theoretical basis for our investigation i.e. the complementarity of two economic activities, we will use this notion of complementarity to analyse the information gleaned during a case study of an SIAE.